And then came the day when I needed to clean out my freezer. 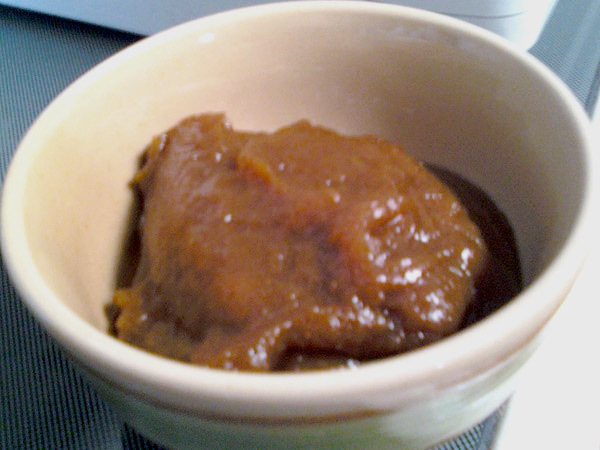 How appropriate that just that week I received a link from a friend on Facebook for a recipe for pumpkin butter. 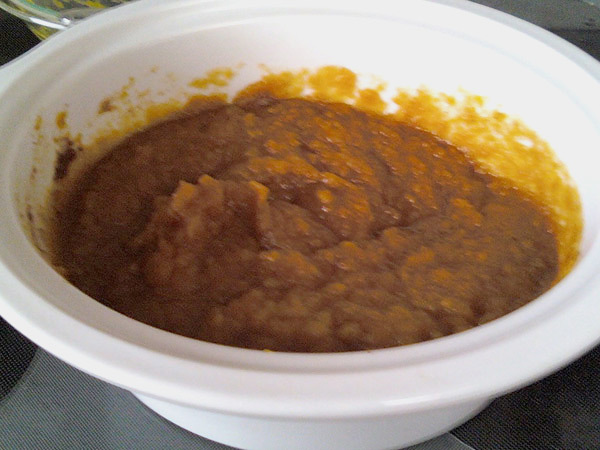 Since both my husband’s and my family are Pennsylvania Dutch enough to have apple butter available at the holidays, the following Saturday I spent the afternoon and evening baking, pureeing, cooking, and eventually, enjoying a very large batch of pumpkin butter. I have to admit – this is SO much better than pumpkin pie! After defrosting the pumpkin slices, shell and all, in the fridge overnight, I placed the slices in cake pans with a half an inch of water, covered them with foil. 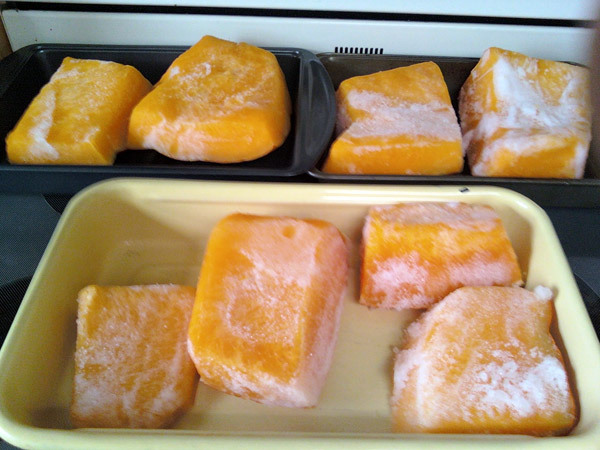 and baked them in a 450 degrees oven until the pulp could be scooped out with a spoon. With a fresh pumpkin this should take 45-60 minutes, but my half-thawed pumpkin took almost two hours. Remove from the oven when soft, and scrape the pulp away from the shell. If you’re working with a jack-o-lantern pumpkin, you’ll want to drain the pulp to remove excess juice. I put the pumpkin in an over-the-sink collander and left it for an hour or two. 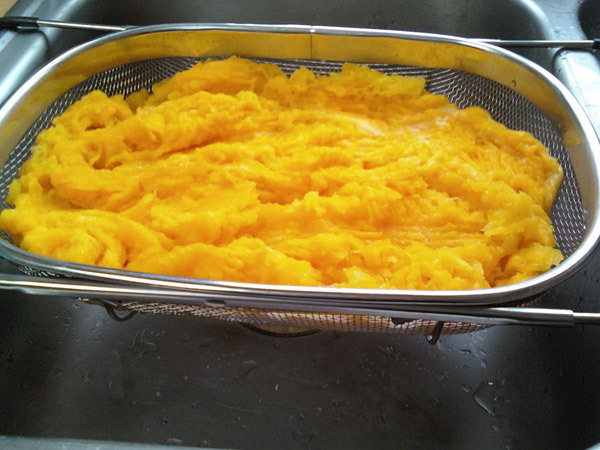 After draining, puree the pulp in a blender. I ended up with 8 cups of puree from the 14 pounds of pumpkin I started with, so it was easy to multiply the recipe by 4, and I added a little bit more of the spices since I used a jack-o-lantern pumpkin. Stir the ingredients and cover with either a lid propped up with a wooden spoon, or with a splatter shield to allow the butter to thicken. Cook on high until as thick as desired, 3-5 hours (approximately). I ended up with about five cups of amazing pumpkin butter. I froze a couple cups in FoodSaver bags for later, and kept the rest in the fridge. I’d suggest spreading pumpkin butter on bread or toast with a little butter, or used as pumpkin pie filling for various desserts. I’m already looking forward to planting pumpkins for next fall! This really does look wonderful. It’s a lot of work but your effort looks as though it produced a beautiful condiment. Kudos. Thanks! Although it was a day-long process, there wasn’t much prep work so I could do other things around the house as the pumpkin cooked. Plus, the pumpkin pie scent that filled my house was so much better than any scented candle!